Best way to troll a quarterback who didn’t want to play for the Chargers: San Diego fans. 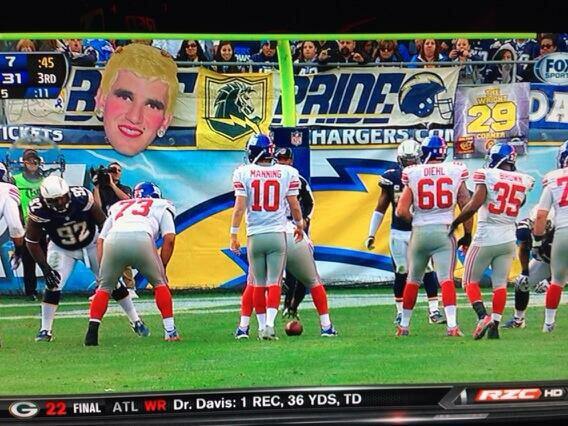 Remember all those years ago when Eli Manning refused to play for the Chargers if the team took him with the No. 1 pick in the 2004 NFL Draft? 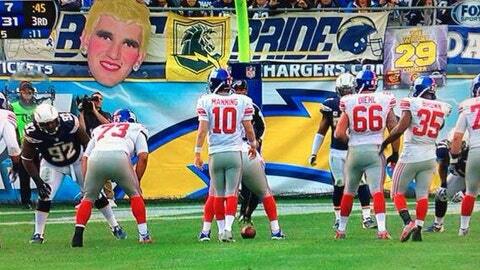 Well, Mr. Eli came back to Ron Burgundy’s hometown and the fans were there with a special greeting. I think we can all agree that Eli would make one ugly woman (if that’s what he’s supposed to be there). Most determined FOX cameraman: This poor guy deserves a medal for gutting it out like a boss in horrifying weather in Philadelphia. What a warrior! 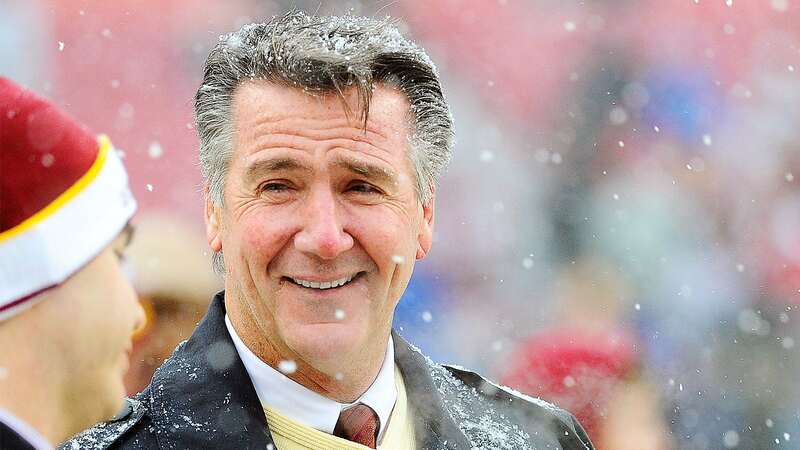 Best reaction to the Redskins season: Bruce Allen, Washington Redskins. The team’s general manager couldn’t say it any better. The Redskins are just laughable after getting their doors blown off at home by the Chiefs. Most accurate depiction of the weather in Philadelphia: Ashley Burns. Actually, I have to think Hoth would have been warmer. At least Darth Vader and his Imperial strike force landed and launched their … you know, I’m going to stop before I completely expose myself as a nerd. Loneliest snowblower of the week: This guy in Philadelphia. Sorry to keep harping on this game but he needs to be pointed out. You can almost sing his praises like a song by The Who. "No one knows what it’s like … to be a snowblower, in Philly …"
Best Animal House reference: Ben Volin, Boston Globe. Props to the Patriots beat writer for this gem. Of course, Brady ended up bouncing back and leading the team to victory over the Browns, but that doesn’t lessen the impact of this golden tweet. 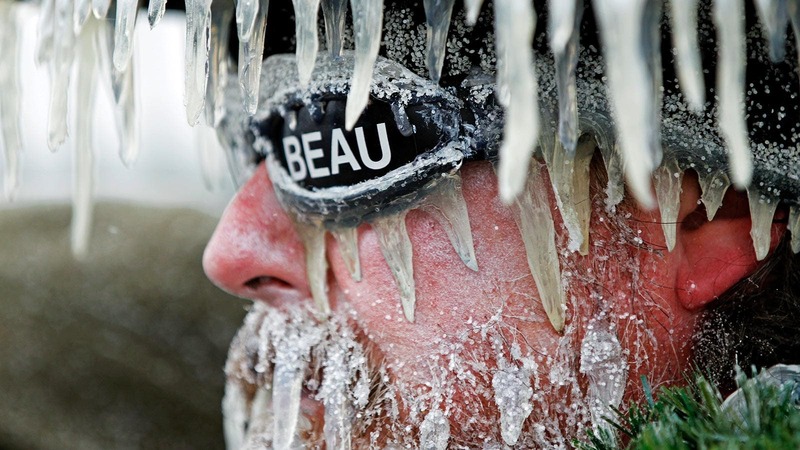 Worst job of keeping your face warm: Packers fan Keff Kahlow. There’s no way that’s real, right? Hardest hit on a reality TV star: Bernard Pollard, Tennessee Titans. It’s kind of strange to see Pollard laying out someone who isn’t wearing a Patriots uniform. However, this hit on Broncos receiver Eric Decker, who stars with his wife on some show on E! or Bravo or whatever, will have to do. Tweet with the most truthiness from a FOX personality: Curt Menefee. There were some serious referee blunders on Sunday and our NFL rules expert Mike Pereira was one busy man. Hmm, @MikePereira gained 2500 followers on twitter today alone!!! You think it's been a controversial day of officiating? 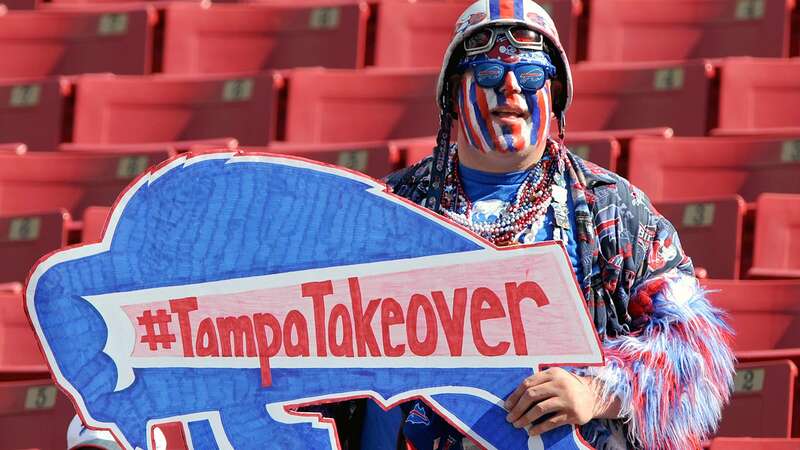 Fan of a cold-weather team who somehow ended up in warm weather: This Bills fan. Kind of strange to see that, on a day with so much snow, a fan from a team basically known for snow is soaking up some rays. He must be happy. Worst job of decapitating of player: Laron Landry, Indianapolis Colts. The safety needs to learn that if he wants to take off Giovani Bernard’s head, he needs to grab, hold and twist. He skipped the second step. Tsk, tsk. Most inspirational tweet from a celebrity Giants fan: Tom Arnold. Hooray for this! Fellow bummed out NY Giants fans: No matter what they are playing the Super Bowl in our stadium and that's almost as good as being in it. Best face full of snow: Calvin Johnson, Detroit Lions. Yes, I’m back to that Lions-Eagles game — but, when Megatron ends up with a face full of snow, it needs to be rememebered. Worst job of failing to run over an entire team: This worker in Baltimore. Too bad, he took his foot off the gas just before knocking the Vikings defense over like bowling pins. Minnesota was so close to a lawsuit. Worst way of dealing with a close loss: Richard Sherman, Seattle Seahawks. The cornerback is among the leading candidates for the Defensive Player of the Year Award, but this comment was asinine. Dude, you lost. Move on, don’t gripe about the calls. Best job of catching a touchdown pass and then almost knocking yourself out: Logan Paulsen, Washington Redskins. The tight end makes a sweet grab with one hand and then gets a faceful of the goalpost. He’s fine, don’t worry. But he needs to be a bit more careful, eh?